Turkey wings are just about the only part of the bird that's tough, which means they're not ideally suited to quick meal preparation. However, they are ideal for long cooking in a crock pot or other slow cooker. This is good news for frugal cooks who appreciate the wings' economical pricing and the crock pot's convenience. Simmering the wings simply in broth for several hours leaves them tender and flavorful, and produces potent soup stock as a side benefit. 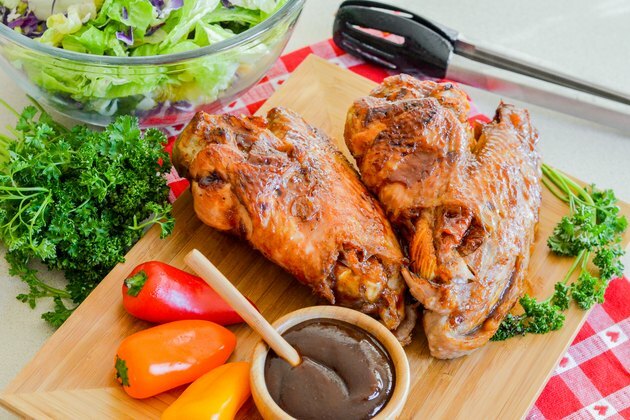 Place the turkey wings on a cutting board, and cut through the joints with a sharp knife. 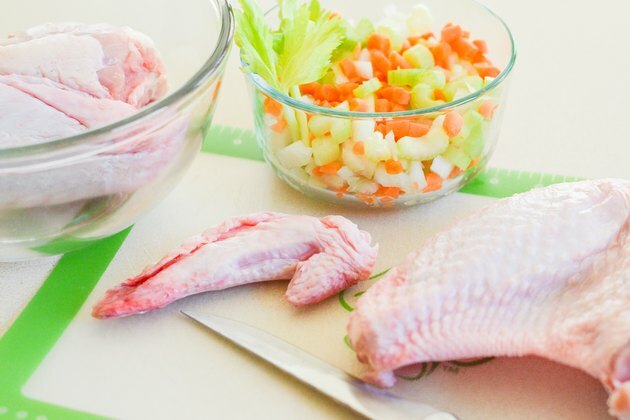 Reserve the pointed wing tips for making broth on another occasion. 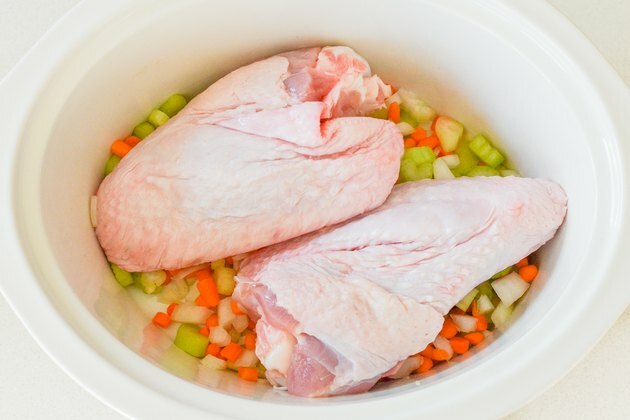 Cover the bottom of your slow cooker with coarsely chopped onion, celery and carrot -- a mixture known to professional chefs as mirepoix -- and stack the turkey wing halves on top of the aromatic vegetables. Pour in 2 to 3 cups of turkey, chicken or vegetable broth, enough to make a pool 2 inches deep in the bottom of the slow cooker. Season the broth with black pepper, but no salt unless it's a low-sodium broth. Cover the pot and plug it in, then turn the cooker on. Simmer the wings on high for 2 to 3 hours, or on low for 5 to 6 hours, whichever suits your schedule best. The wings should be very tender, with the flesh almost falling from the bones. 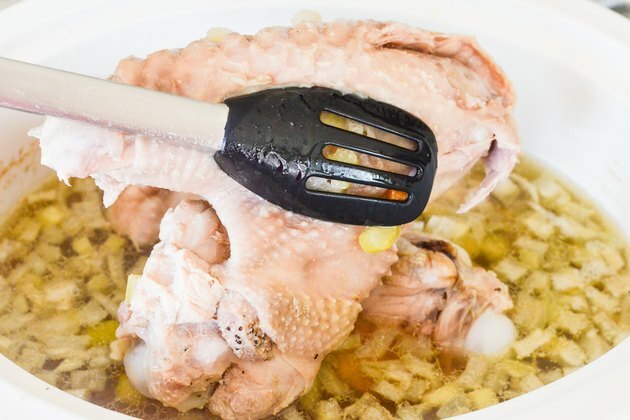 Remove the wings from your crock pot carefully with tongs or a slotted spoon. Serve the slow-cooked wings as they are, with gravy or your choice of other sauces. Alternatively, let the wings cool and become firm. 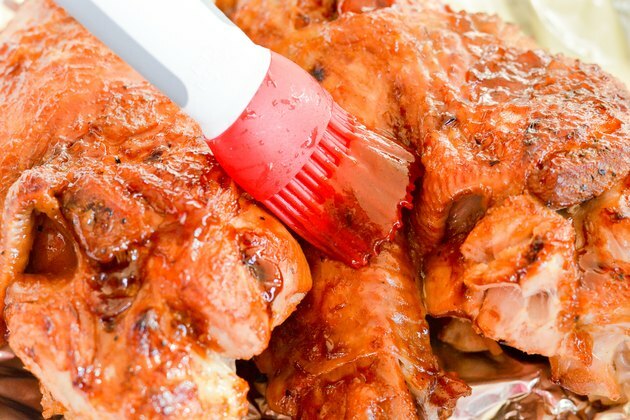 Brush them with barbecue sauce or other glazes, and grill or broil them quickly for a bolder-tasting entree. For a more savory flavor, brown the turkey wings first in a heavy skillet. Mirepoix should be half onion, with the other half divided evenly between carrots and celery. Too much mirepoix gives broth a vegetable rather than a meat flavor, but In this case you can use up to a cup of mirepoix with 2 to 4 cups of broth. The turkey wings have a strong enough flavor to dominate the vegetables. 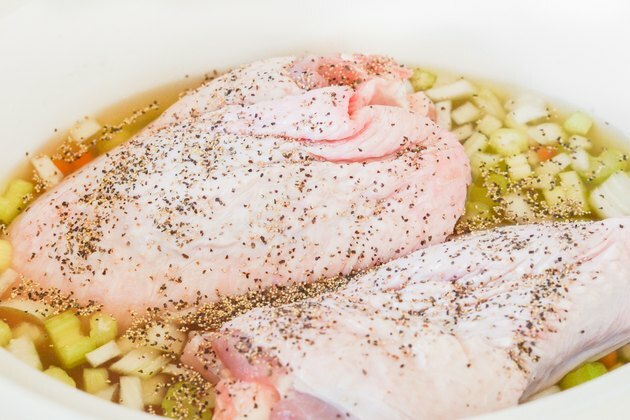 It's best to use turkey broth, but either vegetable or chicken broth will absorb turkey flavor from the wings. For food safety, it's best to start the turkey wings on high for 1 hour, and then turn the cooker down to low for longer cooking. Can I Bake Wings and Put Them in a Crock-Pot?